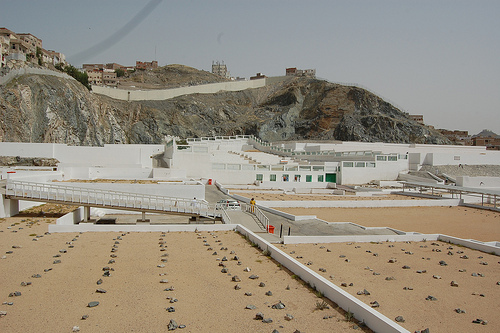 This is the famous grave yard in Makkah not to too far from Masjid Al Haram. Many of the Companions, their followers, scholars and the righteous are buried in this graveyard. One of the most famous graves is that of Lady Khadijah (the wife of the Prophet [SAW]). Other graves include those of the Prophet’s (SAW) ancestors and family members including his uncle Abu Talib and his grandfather ‘Abd Al Muttalib. In the previous era the graves thought to be those of famous companions or family members of the Prophet (SAW) was marked and noted, with some having domes above them to distinguish them from the rest. The dome and grave markings were all removed by the early Saudi Establishment under the leadership of Abd Al-Aziz ibn Saud, the first King of Saudi Arabia. May Allah grant peace to all the Companions, Scholars and Muslims that are buried there.